BREAKFAST, LUNCH AND DINNER ALL AT BELOW $10! a) Breakfast: just one You-tiao (doughstick) at 90 cents to be soaked deep in a cup of piping-hot coffee-gao (thick kopi) ($1). The You-tiao dripping with the aromatic thick kopi was so nice and melted really into my mouth. I have not had this combination for a long time and just spending less than $2 on this simple but nutritious meal is simply rewarding before I set off for a busy work day filled with meetings after meetings. b) Lunch: as I had to rush for another meeting with my bosses; I settled for a mixed vegetarian lunch comprising vegetables, pumpkin and some meat. At just $2.80. Not at a hawker centre but at an industrial-area canteen. 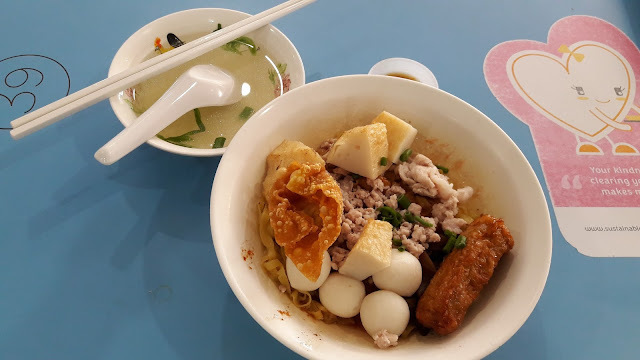 c) Dinner: went out for dinner at a hawker centre again with my family since the next day (6 Nov 18) was a public holiday. Had Kwee Chap meal at $3.50 and a cup of Bandung drink at $1.30 for a total of $4.80. All in, my all-day breakfast, lunch and dinner was just $9.50!